Looking forward to you visit! 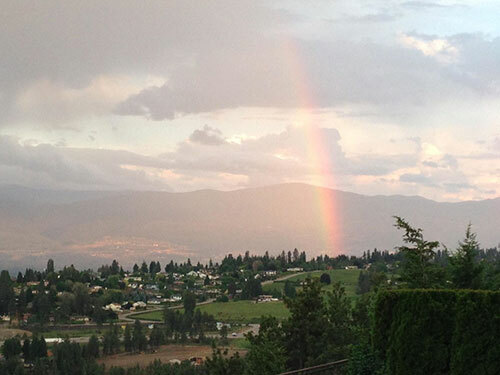 "A View of the Lake" B & B is located in beautiful West Kelowna only minutes to Kelowna's downtown core. Owners Steve and Chrissy Marston would like to personally invite you to their modern and contemporary bed and breakfast. Set in the wonderful wine country region of British Columbia, our home is inviting, tastefully decorated and boasts incredible panoramic views of Lake Okanagan, the surrounding mountain vistas, and of the City of Kelowna. We aim to make your stay at our Bed And Breakfast a memorable one. Our award-winning Bed & Breakfast facility offers 4 beautifully appointed guest rooms, with wonderful views of the surrounding areas. There is ample free parking for all of our guests on our Bed & Breakfast property. Although we are adult-oriented, children over 12 are welcome. We regret that we cannot accommodate any pets. Our street address is within the City of West Kelowna's boundaries, however we are actually closer to Kelowna's city center than many Kelowna B & B's, being only moment away from the William Bennett Bridge linking the two sides of Lake Okanagan. Once you cross the bridge, you are in the Cultural District, which offers dining, theatre, concerts, sporting events and more. Established in 2006, we have been pleased to welcome guests to our bed and breakfast for many years. Our goal is to ensure a memorable stay in our home, and an enjoyable visit to the surrounding areas. Not only do we offer beautiful guest rooms, our visitors truly enjoy "the fruits of our labour". With host Steve being a professional Chef, you can be assured of some incredibly tasty breakfasts to meet everyone’s dietary needs. We at A View of the Lake pride ourselves on offering the best possible start to your day. 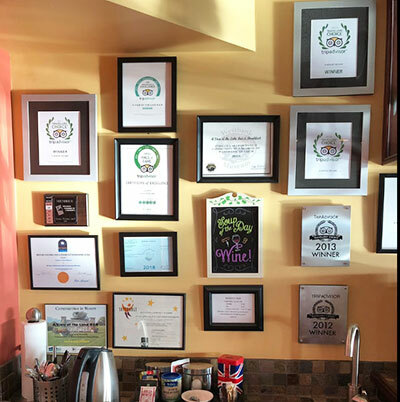 Our Kelowna area Bed & Breakfast	has been garnering yearly awards on a consistent basis from shortly after we first opened onwards. Our pride in our service, our food and our hospitality is reflected in the constant recognition awarded to us by our visitors.